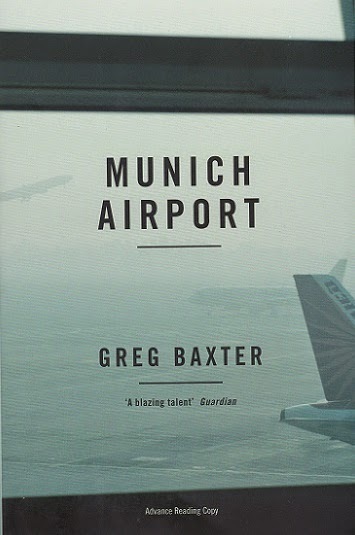 Recently I was passed an ARC of Greg Baxter's Munich Airport, I had been very tempted by his previous book The Apartment but somehow managed to allow it to slip through my fingers, but there was something in the description of his latest which had me contemplating the book before even picking it up to read. The book is narrated by an American expat living in London who receives a call informing him that his sister has been found dead in her Berlin flat, the cause of her death is discovered to be due to starvation. The central setting of this flawlessly constructed novel is of the narrator and his father waiting for their flight back to the States from Munich airport, assisted by Trish who works at the American Embassy there. Whilst waiting for their departure the narrator retraces episodes from his life leading up to the trip he has made to Germany with his father in order to identify his sister, Miriam, and of organising the return of her body back home. These reflections come to us in a fragmented way, scenes are set and then returned to and extended upon presenting an almost rippling effect of recollections, as well as studying his relationship with his parents and Miriam there is a sense that the narrator is cross examining himself, he relates his life story, his travelling and settling in London, the breakdown of his marriage, perhaps some readers will find the book a formidable read in multiple ways, the book comes without the division of chapters and there is not a great deal of straight forward dialogues, but for me this added to it's unrelenting nature and it's absorbing aspect. Obviously a theme that is not too distant in the novel is one of self harm, although it is not explicitly done, it allows the reader space to consider the larger reasons behind Miriam's starvation, denying herself food enables her a sense of empowerment, and when this fact becomes apparent to the narrator and his father, they too display signs of denying themselves food but this too is subtly disguised, was their lack of food and eating merely a consequence of their constant travelling or is it in an unconscious attempt to empathise with Miriam, but the spectre of self harm appears again towards the end of the novel in the narrator in a more obvious way, we get the impression or feeling that this could be caused by feelings of guilt, but by what exactly, there seems to be an emotional distance between his father as well as Miriam which the narrator seems to have antagonistic feelings over, earlier in the novel we learn that his mother had passed away previously when he was young, this relationship is also examined in flashbacks, there is a lot of space here, psychologically speaking, that could be debated over, perhaps the cause of the narrator's feelings are caused due to a culmination of these past relationships and events that are slowly pushing himself further away from himself and his surroundings, a well recommended novel.